Find out more about the Lorex 8 Megapixel HD IP Active Deterrence Security Camera with features, pricing, and FAQs. 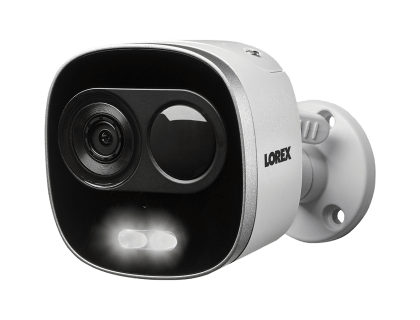 The Lorex 8 Megapixel HD IP Active Deterrence Security Camera is a security camera from Lorex that can be used indoors or outdoors in any conditions. Pros: Night vision. Siren alarm. 128° field of view. Cons: Camera angle cannot be adjusted remotely. Bottomline: Although the Lorex 8 Megapixel HD IP Active Deterrence Security Camera cannot be adjusted remotely, it still provides excellent video quality for a wide range of security applications. What are some Lorex 8 Megapixel HD IP Active Deterrence Security Camera alternatives? Where can I buy the Lorex 8 Megapixel HD IP Active Deterrence Security Camera? The Lorex 8 Megapixel HD IP Active Deterrence Security Camera is available on Amazon and on the Lorex official website. Does the Lorex 8 Megapixel HD IP Active Deterrence Security Camera work at night? Yes. The Lorex 8 Megapixel HD IP Active Deterrence Security Camera is equipped with full-color night vision that can see up to 130 feet. Can the Lorex 8 Megapixel HD IP Active Deterrence Security Camera be used in any weather? The camera is designed for indoor and outdoor use in all conditions and has a tough weatherproof exterior.